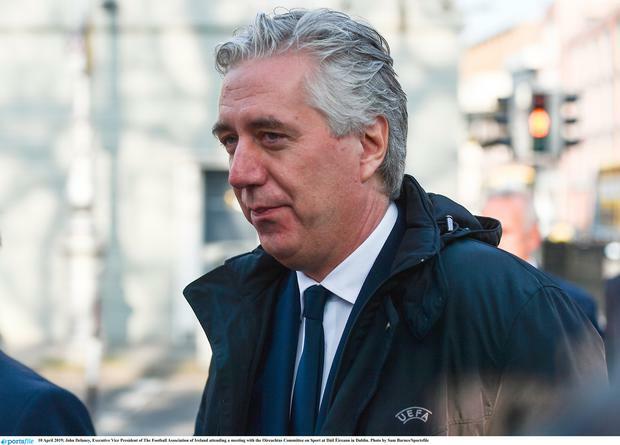 JOHN Delaney is being portrayed as the ‘Donald Trump’ of the Football Association of Ireland (FAI) and parts of the media have been “gunning” for him, a TD has claimed. Fianna Fáil TD Kevin O’Keeffe made the remarks as former FAI chief executive Mr Delaney appears at the Oireachtas Sport Committee today. Earlier Mr O’Keeffe asked Mr Delaney how his salary was calculated while he was FAI ceo. Mr Delaney was on a salary of €360,000 in his former role in recent years. Mr O’Keeffe asked Mr Delaney if he had taken his “eye off the ball” through his work abroad for Uefa. Mr Delaney said he’s been in clear in interviews about his busy diaries added that he accepted he was “very well paid for it, no better man to accept that”. He said: “I have a 16-year daughter who mightn’t see me for a month. Mr O’Keeffe put it to Mr Delaney that he’s being portrayed as “the Trump of the FAI” who has grassroots support adding: “certain parts of the media have been gunning for you”. He said that one criticism of Mr Delaney over the years has been that he is not giving enough attention to League of Ireland. Mr Delaney said he understands the League of Ireland intimately “as part of my personal DNA” and he stood over his record.